Strangest crane game prize? Baby fugu, aka blowfish, aka that delicacy that annually kills a few Japanese people. Spotted at a game centre in Tokyo's Shimokitazawa. There is no known antidote for the lethal blowfish poison. Victims are paralysed and gradually die of asphyxiation. Fear not arcade patrons! These prizes are of the nonpoisonous variety. 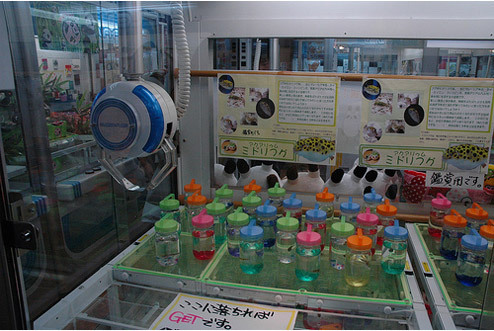 There are shades of The Lobster Zone, the crane game that let's you catch your own dinner, each individual jar contains baby fugu. As Japan blog Tokyo Mango points out, "Blowfish are very sensitive creatures and need careful handling. They are easily agitated and even minor changes in the environment, such as switching off lights in the room can cause stress." When the blowfish puffers, it may be cute and all, but actually shortens the life of the fish.